Link to Composites, 1962 - 1971 (link goes to site for Bobby Ogdin '66, named a Significant Sig in 2015). 1970: Beta Sigmas help Install MTSU and Tenn. Tech. Several Beta Sigma alums helped with the April 5, 1970 installation of the Sigma Chi chapter at MTSU. Bob Mifflin, '63, was Chapter Advisor, and Frank Womak, Vanderbilt and Tenn.-Knoxville '41, assisted. Ashton McWhorter, '44, helped prepare the chapter for the petitioning process. Earl B. McClanahan, '44, the Tenn. Province Grand Praetor, gave the pledges their oath. Two weeks later, for the April 19, 1970 Installation of the Sigma Chi chapter at Tenn. Tech: Earl B. McClanahan again conducted the pledging ceremonies and began preparing the local chapter for I-Week. The Beta Sigma Chapter performed the Ritual. Tennessee Tech president Dr. Everett Derryberry, '29, formally welcomed the chapter to campus during the post-ceremony banquet. A UT Daily Beacon writer noted that in the spring of 1973, streaking down the Strip was a fad. He reported that "thousands of students would gather for several nights along the Strip to see which sorority would offer up its pledges for this new intramural event. (As I recall, the Little Sisters of Sigma Chi actually provoked the most response.)" Erle Hall '50, was the Chapter Advisor for the local colony that started in 1974. The chapter in Tampa was installed in 1979. 1979-80: All-Fraternity; 2nd or 3rd All-Univ. 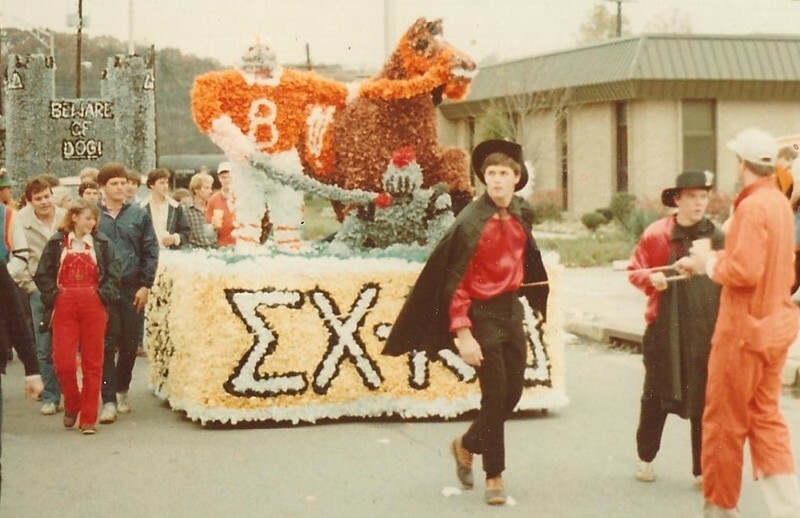 Sigma Chi and Kappa Delta won 1st place overall in 1979 Homecoming.